Which attic TV antenna should I get? 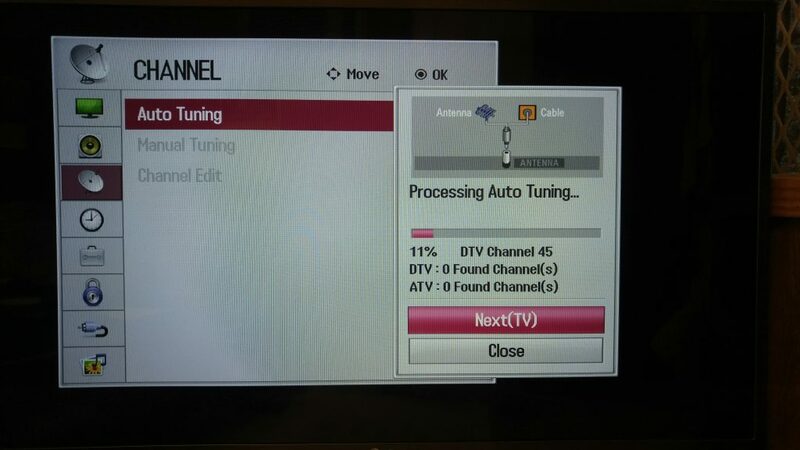 Our guide that shows people how to get free cable TV channels by using an antenna always results in the same questions. They usually include “what is the best attic TV antenna?”, “should I put my antenna in the attic or on my roof?”, and so many more that all boil down to the same thing. 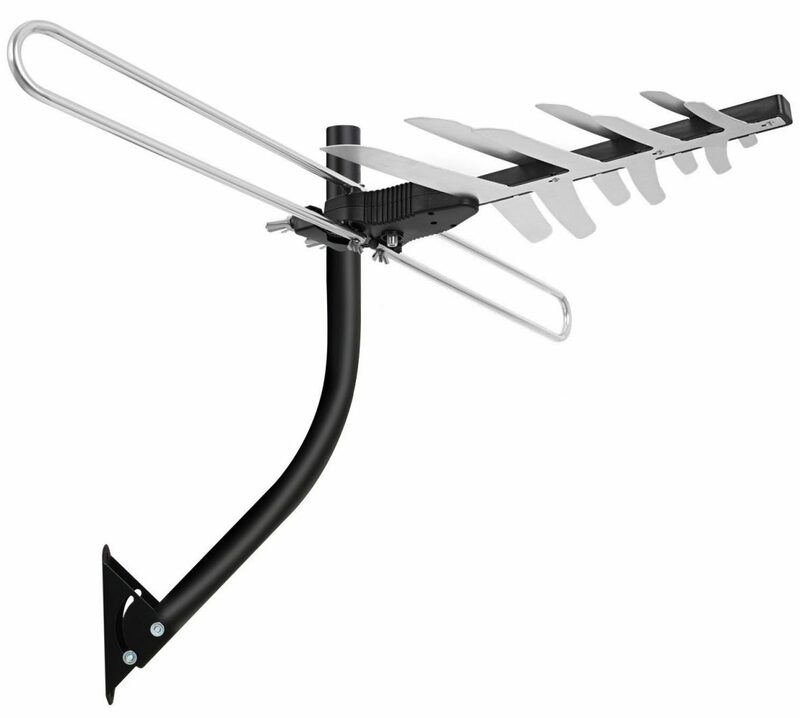 “What is the best attic TV antenna?” Our guide briefly touches on the major types of antenna and even mentions a few brands, but doesn’t go into them with much depth. In order to help you choose the best attic antenna, we’ve reviewed some of the most popular models and have written a full outline for each so you can compare them and choose. Should I mount my antenna in the attic or on the roof? If you haven’t read the guide that we wrote and linked above (here), we highly recommend you do so. Unless you’ve come here with a good understanding of your TVFool.com report and know that you definitely need an attic mounted antenna, you might be wasting money. There’s no point in paying more money and installing an attic mounted antenna if your TVFool report says you can get all of your required channels with a cheaper indoor antenna. If you don’t have the time to read the guide, the basic rule for the TVFool report is to look at the colors for the channels you want. If your channels are mostly green but have a decent amount of yellow ones that are important to you, an attic antenna might be the right choice. 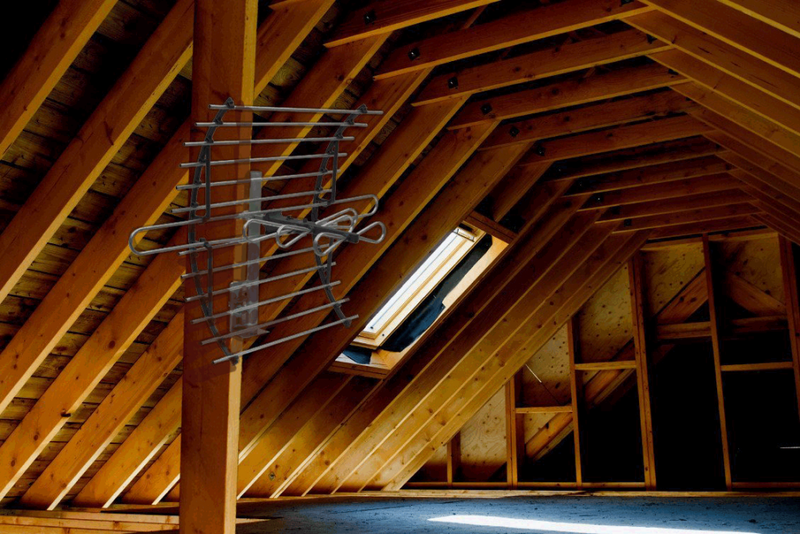 When choosing between an attic or a roof antenna, it’s important to know that you’ll almost always get a better signal with a roof mounted antenna than an attic mounted one. It’s certainly possible that some of the signals may not be strong enough to be picked up with an attic mounted antenna but could be received with the same model that is mounted on the roof. 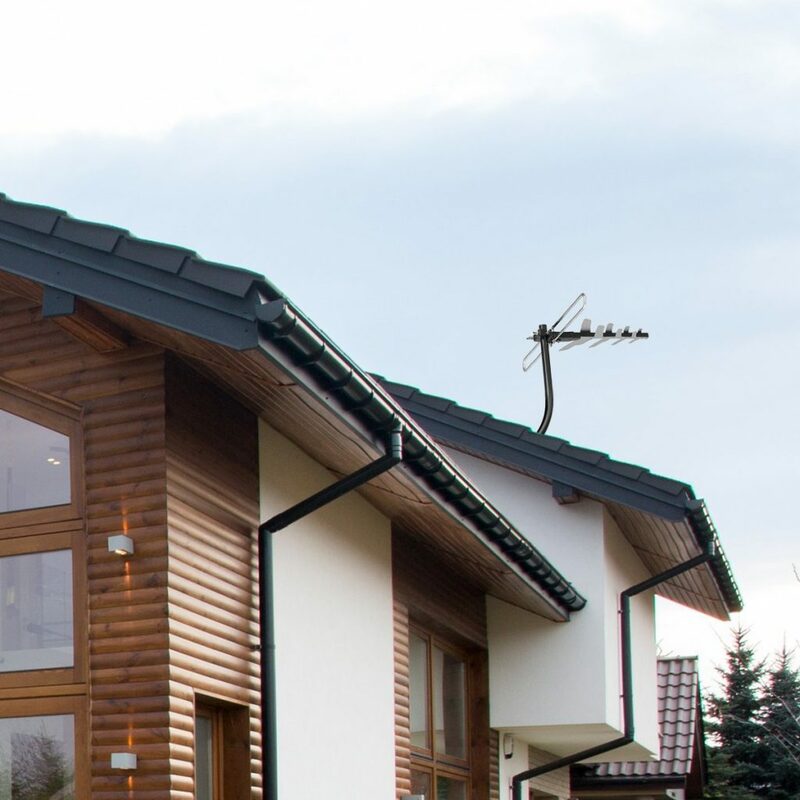 There are a lot of different reasons for this that include building material, roofing material, insulation, or even just the slight different in elevation. The good news is that you can always install the antenna in your attic first to test the results and move it onto the roof if they aren’t sufficient. The first and most obvious benefit of mounting an antenna in the attic instead of on the roof is that since it’s inside, it’s not going to be impacted by weather. Not only are you far less likely to lose signal during a storm, the antenna should last a lot longer due to not being worn down by the weather. Another reason most people gravitate toward indoor or attic mounted antennas is that they don’t ruin the aesthetics of the house. Some outdoor antenna are extremely large and can be an eyesore on your otherwise great looking home. 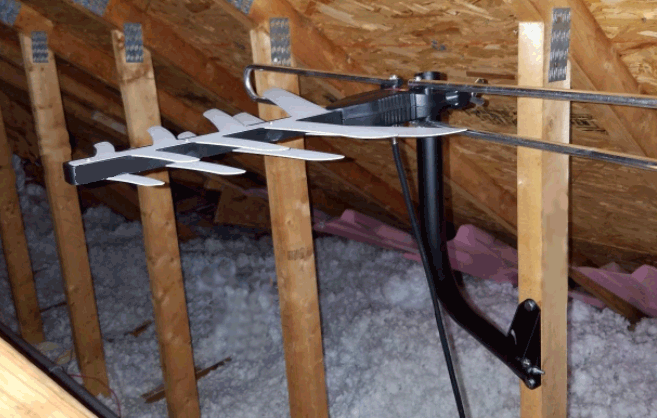 An attic antenna let’s you get a similar antenna in terms of strength, but stays nicely hidden away in the attic. If you’re installing the antenna yourself it’s also beneficial to know that an attic antenna doesn’t need to be grounded. The installation for a roof mounted or attic mounted antenna is otherwise extremely similar, but not having to ground it does make the installation easier. If you’re coming from our indoor antenna guide, the 1ByOne brand should look familiar to you. We recommended their indoor antenna as the best option in it’s category too. 1ByOne is fantastic at putting out super high quality products and are cheap enough that they could still be placed into the “budget” category for pricing. Considering how much a monthly cable bill is, it’s always surprising how inexpensive it is to get a quality antenna. The 1ByOne 85 itself is a high performance antenna and is marketed to pick up all HD channels within an 80-mile radius from your attic (although we would re-label it at closer to 60-70 miles). One huge benefit of buying a 1ByOne antenna is that the company offers great warranties and money back guarantees. Finding the right antenna can be difficult and frustrating because everyone’s results are dictated by their location. This usually results in a higher than average return rate compared to other consumer electronics. 1ByOne notes on their Amazon page that they guarantee your money back within 30 days of purchasing because they want you to test it and see if it works in your location. Buying anything on Amazon already offers a lot of buyer support, but knowing the company promotes testing of their products helps to sweeten the deal. 1byone Comprehensive Warranty – We stand behind our antenna 100% with a 12-month warranty. Please Note: Freeview reception is dependent upon environmental factors, we cannot guarantee reception in all conditions. We do offer a 30 day money back guarantee on all new items in order for you to test the suitability in your area. 1ByOne also offers a comprehensive warranty and will honor it for 12 months. Even though a year’s warranty is great, with the construction of the antenna you probably won’t need it. The antenna is mostly plastic, but far from flimsy. It’s parts feel quite a bit thicker than some of the other antennas we reviewed, and as long as you’re not throwing it out of attic window it should last a long time. (It might actually even survive the toss!) The pole in particular is solid metal and really helps the antenna to feel sturdy and durable. If you’re concerned about set up or installation of an attic antenna being an issue, the 1ByOne 85’s install couldn’t be easier. It’s not quite pre-built in the package, but it might as well be. A few quick screws and wing nuts and you’re good to hook up to the coaxial cable. It does only come with one coaxial cable though so you’ll need need another one to run from the amp to your TV or splitter. If you keep reading our reviews of other attic antennas, you’ll quickly see how easy the install of the 1ByOne 85 actually is. It says a lot about the ease of installation when the most difficult part is screwing the post into your wooden rafters (or wherever you’re mounting it). If you’re not too handy or just don’t feel like spending much time installing an antenna, the 1ByOne 85 should definitely grab some points. 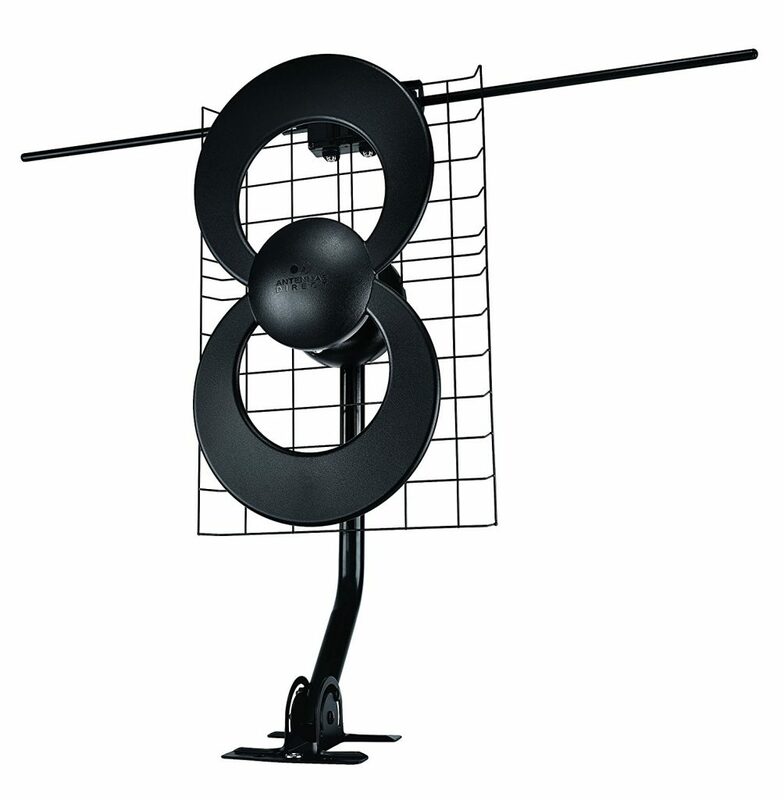 The 1ByOne 85 get’s our top rated spot for the attic antenna reviews. It’s one of the simplest antennas to install and offers one of the longest ranges for the price. Although the 85 miles might be a little bit of a fish tale, even at 60-70 miles it’s top of its class. We’ve recommended the 1ByOne brand before and have heard nothing but good things about the brand. We try and recommend antennas that work well in multiple situations and the 1ByOne 85 accomplishes that by being efficient in the attic or mounted outdoors. ClearStream is another huge name in the world of antenna. Like we discussed for the 1ByOne antenna above, ordering an antenna through a major company is a huge benefit to you as a consumer. The ClearStream 2v antenna comes with a lifetime warranty and their customer service department is one of the best. Hopefully you won’t have to return it, but if you do at least it won’t be a huge hassle. The ClearStream 2v installation is a little bit more difficult than the 1ByOne. It’s not overly difficult, but it does require some tools and some time. You’ll need a phillips head screwdriver, an adjustable wrench, a drill with a 3/16″ drill bit, multiple ratchet heads and driver, and coax cable. It’s similar to setting up Ikea furniture in that it comes with a lot of pieces, but the directions are clear and concise. Antennas Direct (the manufacturer of the ClearStream 2v) has quality YouTube videos that discuss their products and show how to install and use them. The video for the ClearStream 2v is below, and makes putting it together a lot easier than reading the instructions. The antenna itself is 20″ x 12″ and has 35″ raised dipoles that stick out from the sides. The j-mount pole is the same size as 1ByOne’s at 20″ and is metal with a weather proof coating. 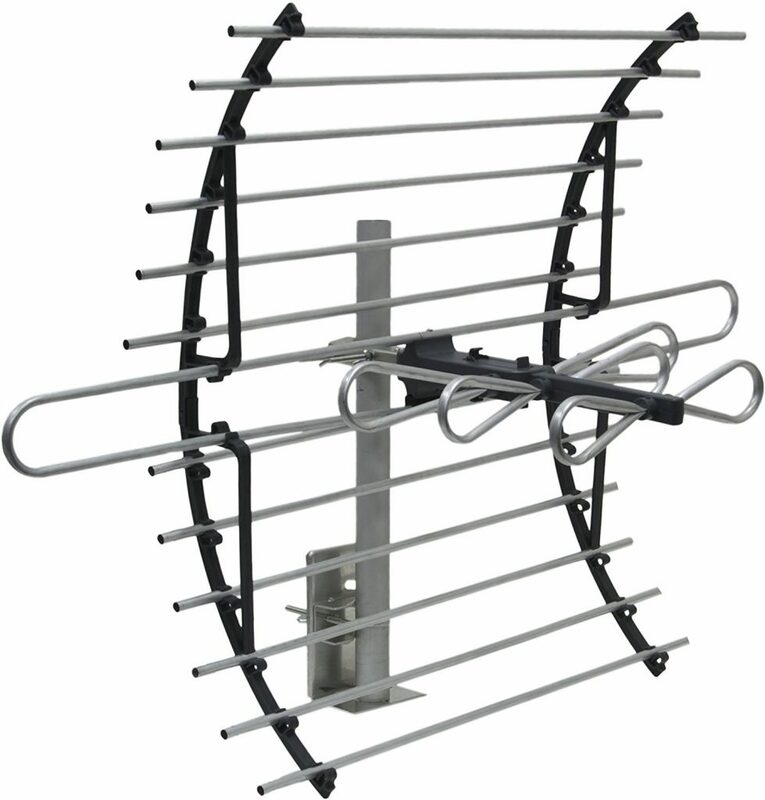 The “tapered loop” design is one that Antennas Direct uses a lot and claims it allows the antenna to respond to a greater range of frequencies. Considering we’re putting the antenna in the attic, the aesthetics of the antenna design don’t matter to us as much as the design’s functionality. The j-mount is fantastic for mounting to a 2×4 in your attic and the wing nut connection makes it plenty easy to rotate after the pole is set. The tapered loop is made of thick plastic and the shape makes it feel more durable than a lot of the more pointed designs that we see in attic antennas. Everything that’s not metal is made of the same thick plastic, and there’s plenty of protection from water in case you end up moving the antenna outside. Antenna’s Direct believes their products are durable enough to be backed with a lifetime warranty on its parts and we found no reason to disagree. Although a little bit pricier than the 1ByOne antenna, the ClearStream 2v earns its spot in the number two position of this review. It’s a well made product that’s backed by a major antenna company and includes a lifetime parts warranty. The antenna doesn’t lie about its name and actually performs quite well picking up channels close to 60 miles away. Although pointing the antenna in the right direction makes a world of a difference, the ClearStream 2v was able to pick up additional channels that were between 10 and 15 degrees off in either direction. This number will fluctuate based on your surroundings (trees, hills, etc. ), but it’s a solid indicator that the tapered loop design might actually make a difference. Not including a coaxial cable in the package is a little disappointing, but considering the antenna is typically attic or roof mounted we can understand why. Unlike an indoor antenna that only needs a 10′-15′ length of coaxial cable to run, an attic antenna needs enough to reach, well, the attic. The availability of coaxial cable online for cheap and the need to have extra for the install anyway was enough for us to forgive ClearStream and recommend the 2v antenna as one of the best options for attic mounted antenna. We noted in the last two antenna reviews that buying from a major brand is beneficial due to the frequency of returns when trying to find the right antenna. If 1ByOne and ClearStream got a few points for name recognition, the GE 33692 gets the rest. GE is one of the biggest companies in America and isn’t going anywhere anytime soon if you need to contact customer service. They also offer a limited lifetime warranty if anything does happen to go wrong with the antenna. The GE 33692 is approximately 29″ x 21″ when fully assembled. It looks a lot more like an old school traditional antenna than some of its competitors, but why fix what’s not broken? Our first opinion of the antenna when we took out of the box was that it seemed like it was rather cheaply made. The parts are mostly plastic or aluminium and we had our reservations about how well it would perform judging it solely on its construction. Although it out performed our expectations, we wouldn’t recommend installing this antenna outdoors. Out of the three antennas discussed so far, the GE 33692 is probably the most difficult to set up. It’s still not overly complex, but it takes about 10-15 minutes to put together. The previous two antennas came out of the box and were mostly ready to go, but the 33692 comes in a lot of separate pieces you have to put together. It can also be a pain trying to keep track of all the tiny screws. However, once built the antenna loses a lot of its flimsiness and mounting it is rather easy. The build quality of the GE 33692 doesn’t come close to comparing to the signal quality. We had no issues pulling in channels 40-50 miles away and have even received some reader feedback that they are getting channels 70+ miles out. The antenna is marketed at 60 miles and was rather impressive about picking up VHF and UHF channels. If your TVFool report shows a decent amount of VHF signals that you’re looking to pick up, the GE 33692 is one of the better antennas we reviewed for these signals. It was also one of the least directional reliant antennas we tested and were picking up some channels we weren’t even close to aiming at. Since we were so surprised by the signal quality of the GE 33692, we wanted to take a little further and test the signal strength. We used a multi splitter and split the signal onto two TVs and couldn’t notice a drop in quality. Some reviewers said they split the antenna into 4 or 5 TVs, but we didn’t get that extreme in our tests. The picture quality was great and we were pleasantly surprised. Our out of the box impression of the GE 33692 was that it wasn’t nearly as well made as the others we tested. Putting it together was a bit of a pain but not unreasonably so. However, we quickly found that the “don’t judge a book by its cover” saying definitely applies to the GE 33692. It was able to pick up VHF signals that some of the other antennas struggled with and gave us a lot of play in terms of how we oriented it. We picked up a lot of channels and the strength was enough that we could split it without an issue. 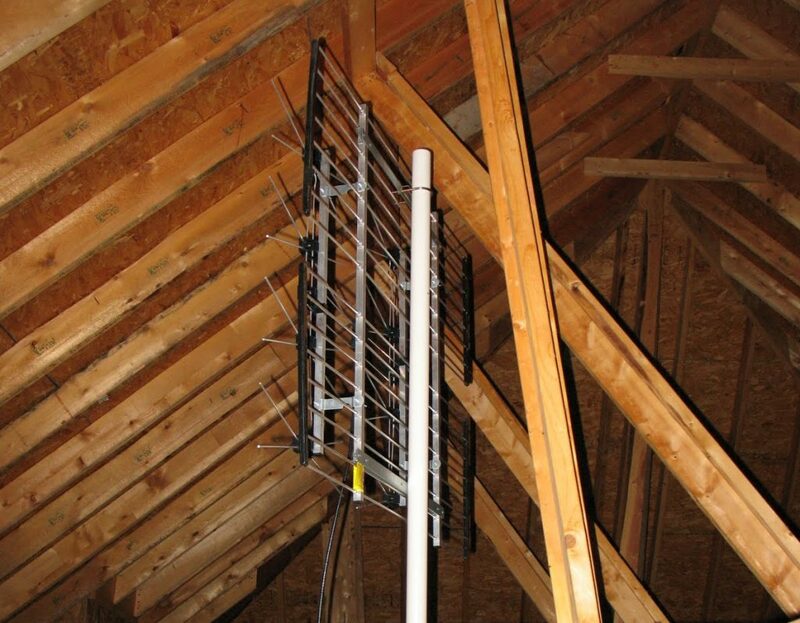 When recommending attic antennas, we try to make sure to suggest ones that could be mounted outdoors if need be. Sometimes the attic’s materials or height have a negative impact on your signals and moving the antenna outside is your only option. You could mount the GE 33692 outside if you want, but based on the construction material we wouldn’t recommend it. 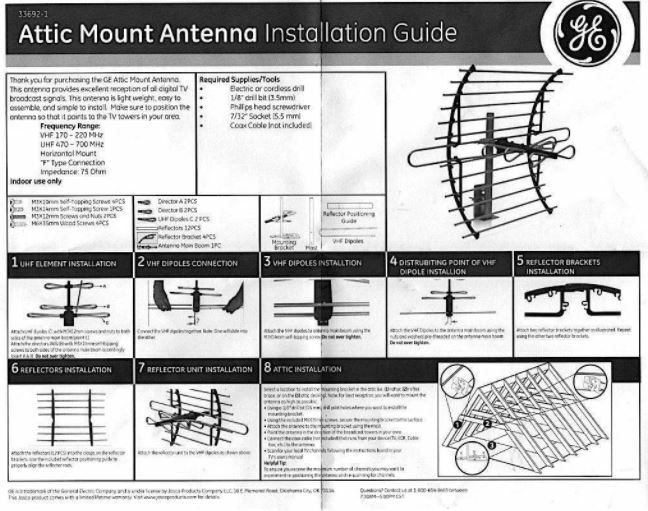 The GE 33692 has a lot going for it and if you’re 100% sure you’re not going to mount it outside it’s a superb antenna option and available at a solid price point. Not everyone has signal towers close by and nicely clustered and struggle to pick up some channels. If you’re house is surrounded by trees, big hills, or other signal blocking cover, you might want to bring out the big guns for an antenna. The Channel Master CM-4228HD is a bit more expensive than the other options, but it definitely makes up for it in signal strength. The CM-4228HD (also known as the Channel Master EXTREMEtenna 80) has a reception range of 80 miles and picks up UHF and High VHF signals better than the other antenna we reviewed. 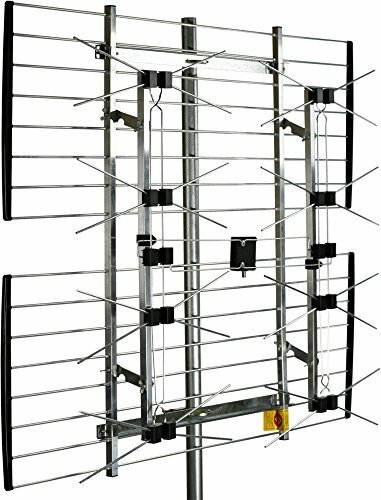 We don’t recommend this antenna as the best option to pick up channels that are 80 miles away, but if you have channels within 50-60 miles and are surround by trees this should be your go-to. The CM-4228HD is a bit bigger than the others and comes in at 41″ x 33″. One frustrating part about it is that it doesn’t come with a mounting pole. It comes with clamps to mount it to a mast (or a broom stick! ), but for its price you’d expect it to have its own mast. Lack of mast aside, the CM-4228HD is actually really easy to install. It comes mostly together in the box and is as simple as tightening a few wing nuts. Like most Channel Master products, the EXTREMEtenna 80 is quite durable and would last a long time even if mounted outside. It may have a lot of flimsy looking components, but even the smaller metal pieces are well made and the antenna holds together well. Although advertised as receiving signals from 80 miles away, we don’t recommend the antenna for its signal distance. We chose the CM-4228HD as one of the best attic antenna you can buy because it’s a great option for people with signal interference. You may be in a really wooded area or be surrounded by hills and struggle to pick up signals that are only 30 miles away with other antenna. We found that the CM-4228HD is able to pick up a lot of these rebounded signals better than the other options. Even if your surroundings are clear, you might need the CM-4228HD anyway based on the construction of your attic. If you have reflective insulation or other signal blocking materials in your attic, a normal attic antenna might not be strong enough to pick up close signals. Other 8 bay antennas will be able to pick up these channels as well, but those are typically much larger and difficult to install; particularly in an attic. If our review for the best attic antenna was based solely on signal strength, we’d likely have awarded 1st place to the CM-4228HD. It’s able to pick up signals that seem awfully far for an attic antenna and also excels at picking closer, but difficult to receive signals. Compared to other 8 bay antennas, the CM-4228HD is smaller, easier to install, and typically one of the cheaper options. However, compared to the other antenna on this list it’s one of the most expensive. The CM-4228HD is not the best option for a lot of people. 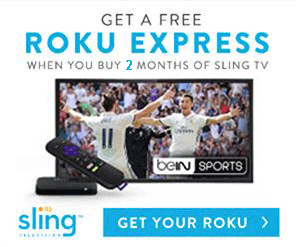 It’s more pricey and bulkier than a lot of people need, but perfect for some. 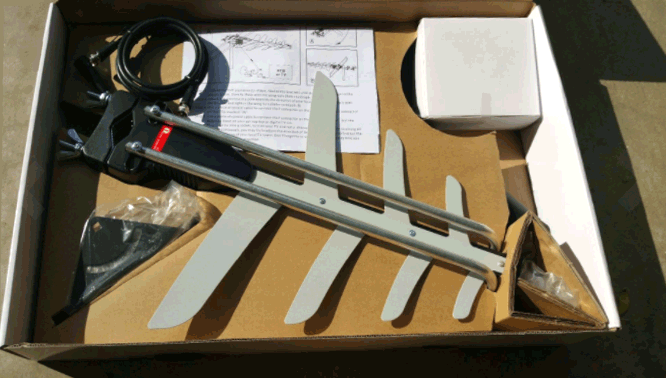 We included it in this review as a final option before you need an outdoor antenna. If you’ve tried some of the smaller indoor or attic antennas that we recommended and don’t want to commit to an outdoor one yet, the CM-4228HD is a great option.